Still a couple days left if you are interested in yesterday's giveaway - 2012 Cooperstown. Today, I am racing the clock. I forgot to type this post up, so let's see if I can spell correctly a giveaway cards in 10 minutes. Small batch today: Basketball. 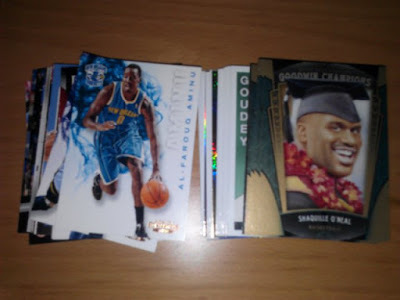 Maybe 4 or 5 packs worth of cards from the LCS pack wars during the season. I think I sent some of the cards off to some people. Heck - I don't remember. I just know I don't collect basketball anymore so I never have a need for them. Got some Hoops, Contenders, SP Authentic and Turkish League. Yes - Turkish League. Upper Deck put out any basketball it could think of. You can also see some Goodwin Champion cards in there. Two packs worth I think. I added them cuz most of the players are basketball players. I really want to like Goodwin. 2009 series was the best, but that set has gone downhill in my mind. Were really nice - now the player look motley. Ok - comment away. Three days and I pick a winner. I'm in if that's possible ! Is it me or does Shaq look like he's at a luau graduation?